“Building Trade Capacity: Challenges of Global Trading System” and “Country Working Group: Negotiations on Azerbaijan’s accession to WTO” were the main subject of the conference. By examining the problems in global trade and the ways to resolve them, representatives have prepared a plan of actions. 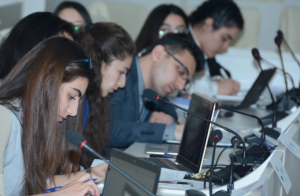 Other students worked on Azerbaijan’s accession to WTO and forwarded their proposals. Later, representatives discussed the conditions required to join the WTO, commitments set forth and held debates. Conventional declarations were adopted by the participants at the end of the conference. The proposals for Azerbaijan’s accession to WTO were put forward. For instance, to accede the economy’s dependence on oil and gas export should be minimized over 15 years, particularly it should be focused in agriculture and tourism. Student-experts proposed the liberalization of country’s trade, customs matters should be simplified and the legislation should be brought in line with WTO standards. The participants were presented certificates at the closing of the 3-day conference. 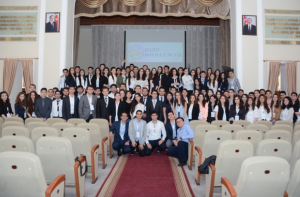 Azerbaijan’s representative Eltaj Rustamli and Oman’s representative Ulvi Ojagli were awarded the ”best delegate” award. The Swedish representatives were distinguished as the “best delegation”. Two winner students have gained the chance to participate at the “International Model WTO” conference to be held in Switzerland in 2017.